Summer is on the way! The days are longer and hotter, and it seems to be happening earlier than usual this year. As a discerning pet parent, it’s your job to ensure that your furry family member is happy and comfortable during these warm months. There are plenty of treats and hot weather games to keep your pup energized and excited, yet safe and cool. You can talk to your vet or breeder about specific recommendations for your dog’s specific breed and size, but these great ideas are perfect for any dog. If you plan to spend time outdoors with your friend, make sure he or she has plenty of shady space to rest. If your current setup doesn’t create enough shade, consider affordable pet shade tents from your local pet supply store. Moreover, you’ll need a barrier between your dog and the hot ground, especially if you’ll be on hot blacktop, which can get very warm and uncomfortable in the hot sun. You can also find elevated dog beds at most department stores. Some manufacturers even offer elevated dog beds with cooling pads! Ice water will go far with your dog, so make sure you have a large supply for playtime. Your dog will have a much more enjoyable time running around if he or she remains hydrated. Plus, we’ve never met a dog that could resist the fun of playing with ice cubes! 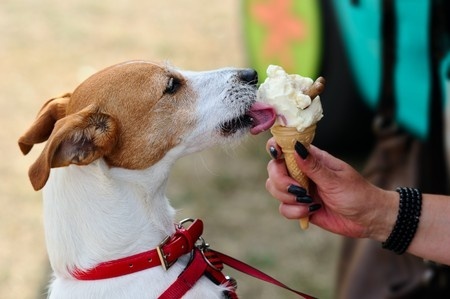 Many dog treat companies offer dog-friendly ice cream cones and other frozen treats, as well. As long as these cool snacks work with your dog’s diet, be sure stock up! If you don’t have a pool, consider getting a small, child-sized pool for your dog to play in at his or her leisure. Dogs love to run and swim, so it shouldn’t be too difficult getting your pal in on the fun! For even more ideas on how to have fun in the sun with your pup this summer, check out this list of fun games that dogs love to play in the summer months!